Arusha Conservation Agriculture Forum (ACAF) was formed after the first Farming God's Way training, when participants wanted to support conservation agriculture. Chrispin Mirambo was the first secretary and since the beginning of ECHO, ECHO has taken on a main role to host and be ACAF’s current secretariat. ACAF members are comprised of various NGOs and governmental organizations within the Arusha area; TPRI, MWIVATA, Horticulture Tengeru, local farmers, journalists and teachers make up the majority of members. These stakeholders meet after every three months to discuss current issues in conservation agriculture and other work that is being implemented. The ACAF members have benefited from learning various techniques and better practices from surrounding organizations and institutes in the Arusha region of Tanzania. In 2014 ACAF created a seed exchange initiative where local farmers can exchange indigenous seed varieties with other farmers. Since ACAF has been established, the seed exchange has been held three times. Members of ACAF and participants of the seed exchange program have encouraged ECHO to continue and increase the program because of its huge benefits to farmers. 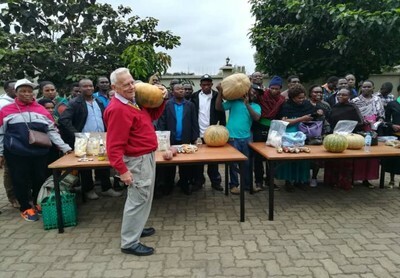 Within one of the previous seed exchange days at an ACAF meeting in 2016 James and Jennifer Kahurananga, residents of Arusha Tanzania, attended and met with a farmer from Mbeya, a southern region of Tanzania. The Kahurananga couple received from the Mbeya farmer seeds from a local variety of corn. Following the seed exchange they also took cuttings of Chaya and Canavalia from the ECHO seed bank. After the last seed exchange within the most recent ACAF meeting, August 2018, Mr and Mrs Kahurananga phoned Charles Bonaventure informing that the seeds which they received from a previous seed exchange are still being eaten to this day. The couple invited ECHO staff to their home in Sakina, Arusha to see the success from their experience in the seed exchange. ECHO staff visited their home and upon arriving they were surprised at the success of the Kahurananga’s home gardens. James and Jennifer Kahurananga showed ECHO staff the various crops they have in their area. Although they are living in the main city, they have used every inch of green space in their property to grow food. The Kahurananga’s have Cow pea, Canavalia, Orange flesh sweet potatoes, bananas, Cassava, celery, onions, cherry tomatoes and Chaya. The couple told ECHO visitors that they have received the majority of the seeds they plant from ECHO and have given around 200 cuttings of Chaya to their neighbors, family and friends. Jennifer Kahurananga says they have not purchased tomatoes at the local markets in almost a year since planting cherry tomatoes, adding that they have plenty of greens and bananas to eat as well. After seeing their garden, the Kahurananga’s shared some of the delicious corn produced from seeds they received at the ACAF seed exchange. While corn was being eaten, James Kahurananga shared, “I have benefited so greatly from the seed exchange, exchanging seeds is so helpful. Even if a type of seed is not available at the store, we have so many types of seeds that are native that we can be sharing with one another. These native seeds are better, more resilient, they improve the environment, and best of all, they taste better! I wish that I could have better access to native varieties of food”. Mrs. Jennifer Kahurananga added, “I didn’t know before that ECHO existed. I think there is a huge need to publicize the availability of native seeds, more people need to know about agriculture of native species. If I see something is native to Tanzania or to my culture, I take it”. The Kahurananga’s and ECHO staff exchanged more ideas about their garden and ways to improve it. The couple said they are wanting to use more green manure cover crops in their barren areas and using extra cherry tomatoes to make tomato paste. The couple is looking forward to the next seed exchange, and already has some native species of their own to exchange with other local farmers.